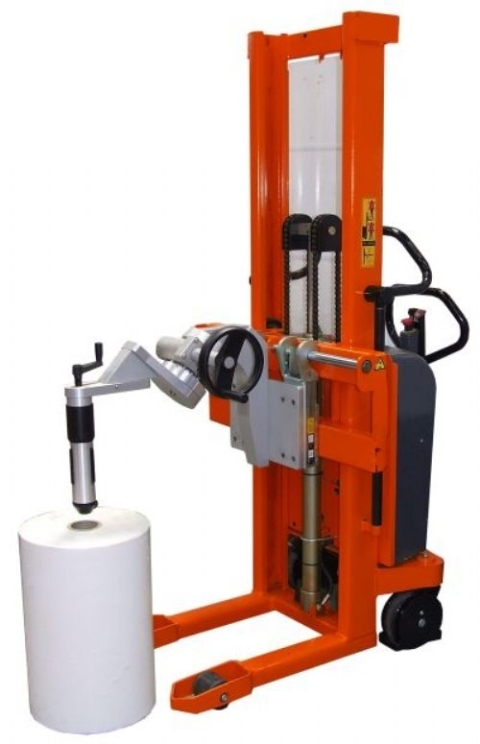 The Grab-O-Matic Reel Turner Attachment – Core Gripper is a stacker attachment for the lifting of objects such as reels, rolls of film or paper. The reels can be gripped in the centre core by an expanding mandrel. Once gripped the reel can be rotated from the vertical plane to horizontal or vice versa. 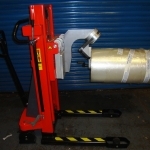 The attachment allows various diameter reels to be loaded or unloaded from racks, reel machines, trolleys and pallets. The Reel Rotator attachments are built specifically to order to suit various reel weights, lengths and core diameters. The range will suit reels with 70mm, 76mm & 150mm cores and from lightweight 25kg reels up to 250kg. All attachments can be fitted to our range of heavy duty stackers with special quick release carriages, or to a carriage on your own stacker truck. 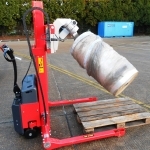 Power rotator models are also available for connection to our range of power lift/drive stacker trucks. 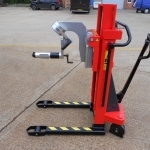 The 76mm or 150mm core grippers can be specified. The reel turner has options of manual or gear box rotation. Once inserted the mandrel can be rotated from vertical to horizontal or vice versa. 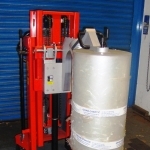 Powered rotation of the reels is also available when supplied with a powered stacker. 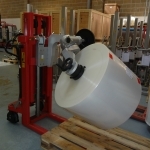 Various diameter, weight and length of reels can be rotated with the attachment.